I have read the Alchemist by this author in the past and liked that book. When I saw that he wrote this one, I added it to my list for Slovenia. I have seen the movie several years ago, so I was curious about the book. I don't remember a lot about it, but I am thinking it didn't take place in Slovenia. I will have to re-watch it to find out. Veronika has decided to commit suicide. Her reasons aren't great - she has a good life, a good job, good family. But she has had enough. She has thought through her suicide - decided the best way to go is by taking a lot of sleeping pills. It doesn't work, and she wakes up in a mental hospital - committed and ordered to get well. Dr. Igor is treating her, and tells Veronika that she has survived her suicide attempt, but they have discovered she has a serious heart problem. This heart problem will kill her in a matter of days. 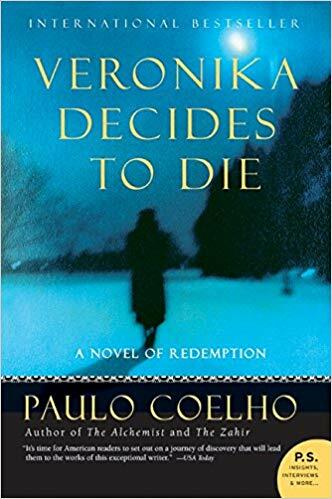 It is now that Veronika starts to learn what it is to die. And to live. She meets a few people on the inside that she comes to admire, and even falls for a young man named Eduard. She tries to fit in a lifetime of living in her final days on earth. This is a pretty good book. It is really, really short. I read it in a day and a half. I didn't think it was as good as the Alchemist. It was a fine book, but I feel like it should have been a little longer in order to become more invested in the characters. It was hard to develop feelings for any of them in such a short amount of pages. Although -the book does really only cover a week in Veronika's life, so maybe this is all there is to say. I would not count it out. Because I saw the movie, I knew the ending of the book already, but if you don't know it - reading the book would be worth it for the ending alone. I tried getting into this a couple times, but didn't find what I was looking for. Maybe I'll try again. It wasn't like the alchemist at all, but I didn't love his book on the valkyries either.